The post New pizza joint, MOD Pizza, headed to Pewaukee – Greater Milwaukee Today appeared first on PizzaNearMe. PEWAUKEE � International pizza chain MOD Pizza is headed to Pewaukee after the Plan Commission approved its application for a restaurant at The Shoppes at Meadow Ridge development, 1450 Capitol Drive. MOD Pizza is a casual dine-in and carry-out pizza restaurant that offers pizza with a selection of 30 different toppings, as well as many salad options. The restaurant will be a 1,408-square-foot space, including a patio with outdoor seating. MOD Pizza will be the sixth business to fill The Shoppes at Meadow Ridge development, which will feature a Starbucks, Chick-fil-A, Jersey Mike�s, Summit Credit Union and Associated Bank. MOD Pizza will still have to receive permits before opening and the grand opening for the store is unknown, said Scott Gosse, village administrator. The post Pizza takes center stage at new Loudoun Street eatery – The Winchester Star appeared first on PizzaNearMe. The restaurant, at 501 N. Loudoun St., was conceived about two years ago by brothers Jesse and Stephen Von Fange and their mother, Karen Darby. A defunct Conoco service station constructed in 1928, which later was occupied by a fish market and a convenience store, seemed like the perfect spot. The architecture is distinctive, the building had been vacant since the early 1990s and opening a neighborhood pizza place had long been the dream of the Von Fange brothers. But securing a conditional use permit from the City of Winchester to allow construction, then gutting the space and reconfiguring the interior, took some time. The result is a cozy restaurant that couples an original historic exterior with an industrial-chic dining room that features a polished concrete floor, exposed ceiling struts, six dining tables and two booths, and counter seating that faces the street. Additionally, two picnic tables occupy a grassy spot outside for warm-weather dining. Anchoring the interior visually is an original mural by former Marvel Comics artist Erik Cherry, picturing George Washington offering pizza to Audrey, the man-eating plant from the musical, “Little Shop of Horrors” while the Handley Library dome rises in the background. But atmosphere aside, the place is about pizza. An open kitchen allows diners to see their pies being made. The brothers learned to make pizza as teens, working in Rudy’s, a pizza place in their home town of Sperryville. Pizzoco — the name is a mashup of pizza and Conoco — features eight house pizzas, from a loaded Hiker’s Special that includes pepperoni, sausage, mushroom, red onion and green pepper, to a white pizza, the Bianca, topped with feta, red onion, olives, sundried tomatoes, spinach and fresh mozzarella. The Winchester is a pizza with fresh mozzarella, soppressata, red onion, sweet peppers and ricotta atop the house-made red sauce. A pizza featuring the sweet-hot combination of pineapple and jalapeno, along with proscuitto, is called the South Pacific. Additionally, patrons may construct their own combinations from listings of regular and premium toppings, and the menu currently includes two salad options. A self-serve water station allows diners to stay hydrated. In recognition of the environment, beverages are served in cups made from corn, with straws made from hay. “It’s not plastic,” Stephen Von Fange said. For those who want more excitement in their sip, Pizzoco carries local Escutcheon lager and ale, San Pellegrino and Sarasota waters and a selection of wines. The restaurant’s ABC license allows consumption both on and off premises, so beverages may be purchased for carryout and unfinished wine can be corked to go. The pizzas begin with a high-gluten (there is a gluten-free variety, too) crust, that provides the stretch necessary for tossing. Pies can be ordered in personal, small and large sizes. Fresh sauce, that begins with tomato fillets, is made daily. “The tomato taste really pops,” Stephen Von Fange said. “It’s a pure, bright tomato flavor,” Jesse Von Fange added. Both brothers began their culinary lives as dishwashers at the Inn at Little Washington in Washington, then honed their pizza recipes at Rudy’s. Jesse Von Fange 37, said that now he is training his staff to make pizzas, and to help his brother get the restaurant open. Stephen Von Fange, 35, has taken leave from active duty as a Blackhawk helicopter pilot for the U.S. Army. The brothers acknowledge that securing the conditional use permit probably added six months to their construction timeline. There was some skepticism, and some outright resistance, from neighbors concerned about a business in what is an otherwise residential area. But Stephen Von Fange said the restaurant received 200 signatures in support during the city’s review. “We’ve had so many people in the neighborhood come and tell us they’re glad we’re here,” he said. The post Portland Pizza Week: 45 slices in 5 days for one man – KOIN.com appeared first on PizzaNearMe. 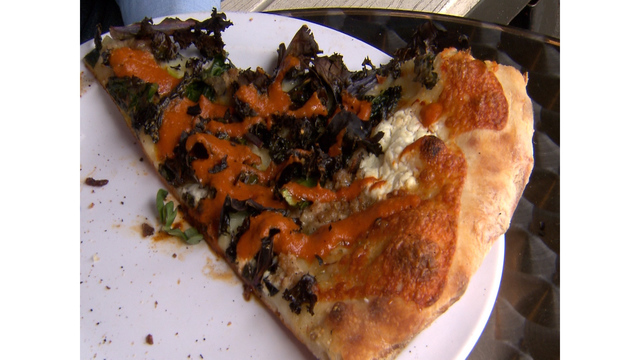 PORTLAND, Ore. (KOIN) — Portlander Andy Mesa is attempting to eat every single slice of pizza during Portland Pizza Week. There are 45 slices on the list, and Mesa has 5 days to accomplish his goal. That’s 9 slices a day. “I don’t eat anything else. So, that’s part of it, like I basically just eat pizza for the entire week,” he says. “I don’t know anyone else that has done it. I haven’t seen anyone else that has done it,” he says. He’s a pizza fan year round, but Pizza Week is a fun opportunity to get out a try new places and slices. “There are a lot of places I only see during Pizza Week. And it’s nice to go to that place and visit, because it’s all over town, and I don’t always go to all those places all the time,” he says. The post Pizza Week at ‘Straight from New York Pizza’ – KOIN.com appeared first on PizzaNearMe. Pizza week started on Monday and ends on Saturday. Portlanders can try different kinds of pizza for special prices. The post These 10 restaurants make the cut for best pizza in Dallas – CultureMap Dallas appeared first on PizzaNearMe. Every year, we single out one wild card category that’s different from the last, with a focus on what’s hot or trending big, whether that’s biscuits or fried chicken. The unique slice at this independently owned concept with two locations, in Allen and Plano, are their internationally inspired gourmet pizzas, with a lineup of different cuisines that takes you around the world. For example, there’s an Indian Tikka pizza with lightly-spiced creamy tomato sauce, chicken, tomato, onions, cilantro, and mozzarella. A Greek pizza has tzatziki sauce, gyro meat, crumbled feta, lettuce, tomato, and black olives. They don’t offer in-house dining; it’s all take-away or delivery if you live nearby. DeLucca takes an approach that’s entirely new. It’s like a marriage between a pizzeria and a Brazilian-style churrascaria, where you pay a fixed price – $19 – to sample an unlimited number of pizzas. Their signature is the garlic picanha pizza — which maes sense since garlic picanha is the unique sirloin cut that’s the trademark of a classic churrascuria. They have two locations, in Southlake and Dallas’ Design District. Small family pizza chain is a relative old-timer on this list, having opened in 2008, on the front end of the Bishop Arts makeover. It does the thin-crust pizza that old-school Dallasites like, with high-end ingredient toppings such as Benton’s ham, house-made sausage, honey, and pepperoni. Key to its appeal, and a big reason it’s on this list, is the way it serves as a true hangout for the neighborhood. It has since opened locations in Forney and Coppell. Los Angeles-based chain founded in 2015 has had some management struggles, making its DFW rollout a little rocky. There are currently three locations, in Dallas, Addison, and Euless. The concept is sound, with a Neapolitan approach that includes a quick bake, a fragrant crust, fewer toppings, and light on the sauce. They have almost two dozen pies, with some toppings going old-school like pepperoni and Hawaiian. In addition to pizza, they also serve appetizers, salads, gelato, and a Nutella calzone. Founded in Seattle in 2008, Mod was one of the first to do the quick, fast-casual pizza experience, like a pizza version of Chipotle, where you go down a line and choose your toppings and get your individually sized pizza baked in minutes. Others such as Pie Five and Pizza Snob in Fort Worth have followed with their own versions. Mod gets points for its focus on the distant suburbs. It’s bringing good, fast pizza to the outskirts of town. Chef Nick Badovinus, who co-founded the Fireside Pies chain, returns to the pizza arena by opening this pizzeria at Highland Park Village, on the ground level of the Highland Park Village Theatre. At Perfect Union, the pizzas come topped with high-end cured meats and cheeses such as soppressata, an Italian dry salami, and scamorza, a mild white Italian cheese. The crust addresses Dallas tastes: It’s thinner. more cracker-y than the pliable crust he introduced at Fireside, or that you find at Neapolitan-style pizzerias such as Cane Rosso. Sauce started out as a member of the Fox Restaurants family; the first opened in Tucson in 2003. The concept changed hands and has since expanded to Arizona, New Mexico, and now Texas, with three locations around DFW. The menu boasts high-end ingredients such as arugula, while the chicken that’s in their bestseller chicken & pine nuts salad is cooked in house and shredded by hand. Pizzas include prosciutto & fig white pizza with black mission figs, goat cheese, and arugula; and the rosemary potato white pizza with spinach, feta, olive tapenade, and truffle oil. Pizza concept from FrontBurner Restaurants (Mexican Sugar, Whiskey Cake, Legacy Hall) does excellent pizzas such as margherita, squash blossom, and spicy sausage, in a modern, expansive environment. Their commitment to wine is big with more than 40 wines on tap and 60 wines by-the-glass. (In fact, they’re repeat nominees for best wine program.) They opened a location in Uptown Dallas in 2018, their second after the original in Plano. Pizzeria on Maple Avenue is from the owners of State & Allen, where they honed their pizza chops. Their pizza is hand-tossed, with a medium crust, not too thin but not a heavy Chicago-style pizza, either, and they have an eye on quality with the ingredients. Varieties include pepperoni, margarita, four cheese, wild mushroom and BBQ chicken with barbecue sauce, red onion, and bacon bits. The restaurant gets props for its eco-friendly practices including smaller all-electric ovens.